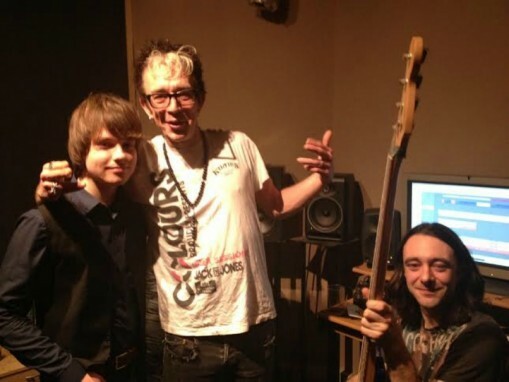 Today in the studio Larry Love and Wizard are fine tuning some tracks with the ever so talented John Lennon McCullagh. The young 16 year old is gaining lots of notoriety, being dubbed as the UK answer to Bob Dylan. McCullagh was signed to legendary Alan McGee's new label 359 earlier this year, after McGee heard him playing a gig in Rotheram. McCullagh became the first fruit of 359 after his debut album 'North South Divide' was released last October in association with Cherry Red Records. After supporting Alabama 3 on tour in December, he came down to our studios here in Jamm to record a single with Larry Love and producer Wizard. Everyone got involved in the vocal arrangements-even myself as I waited to interview him! I caught up with him below and asked him about what it's like re-adjusting to a new life as a musician. John, you followed Bob Dylan on tour in Australia before and have cited it as the thing that encouraged you to begin writing your own music, what was it about that experience that proved to be so inspirational? It was the biggest influence. I was a big Bob Dylan fan at the time and my family were living in Australia. Just seeing him doing it, I made my mind up there and then. I remember coming back from the tour and sitting in my room just writing songs all day. I found an old harmonica and started trying to play it. My Mum came into my room to ask me what I was doing. I knew I had found something I loved doing. It was a real turning point for me. Were you in school at the time? I was at the time but I'm not anymore. I've left school to do this and it feels fantastic. I never liked it. It's all going well so far. Even if I'm never The Beatles famous, if I could do it as a living that would be great. What's your favourite Dylan track? Depends on my mood but I'd say it's 'Sad Eyed Lady of the Lowlands'. If I could write a song like that for someone I love it would be amazing. It has such beautiful words and a beautiful sound. It's the sound of 3am. What kind of a kid were you before you discovered music? I didn't have many friends. I was always quite lonely. I just loved reading and football. I always wanted to be an author. I still would. I loved reading Harry Potter, it really helped me learn to read. I love autobiographies and true stories now. History is my second favourite thing in the world. I took football really seriously. Celtic are my team. I was in an Academy but it took its toll after a while so I picked up a guitar. Was music a large part of your childhood? Yes Elvis, Oasis and The Beatles were big ones in my house. Seeing Elvis on film made me want to be an actor when I was younger. The current frustrations of young people with the economic situation here in the UK has been a subject you've visited in your lyrics...what made you want to tackle this particular issue? Noone else is doing it at the minute, noone popular anyway. I grew up in a politically aware household. I took in what my Dad and my Uncles said. Someone in Brixton might have different views, I just sing about my way of life. You seem quite poitically engaged for your age...do you feel that's something that's missing from music today? Yes. There's only so much you can sing about politically before you start boring people so I would never want to just be known as a 'political' musician. I've got alot of political songs but it's all a balance with my own imagination. What are you up to in the studio with Alabama 3 today? Recording a new single called 'Towerland'. It's a lullaby. It's going really well today so I'm looking forward to hearing how it sounds. It will be out around February. We got the B-side together in Belgium the other day, a Ritchie Valens number. That's on YouTube. I went on tour with Alabama 3 a few weeks ago and thought they were really nice guys. I really liked working with them so that's why we came down to Brixton Jamm today. It's been good seeing them again. What do you have scheduled for 2014? Alot of shows, a second album, doing what I'm doing now, songwriting and hopefully progressing. Hopefully I will get a bigger audience. How do you like working with Alan McGee? I love it. He's more like a friend. He's been very encouraging. He was someone who really spurred me on to write my own songs so I've been very fortunate to work with him.